…AND YOU WILL KNOW US BY THE TRAIL OF DEAD have announced their return to Australia in August 2015 to perform shows celebrating their 20th anniversary in Melbourne, Sydney, Brisbane and Perth. Trail of Dead formed as a quartet in late 1994, with key members Conrad Keely and Jason Reece remaining the staple of the band’s lineup ever since. The third of their nine studio albums SOURCE TAGS AND CODES was released in 2002 to extensive critical acclaim. The band’s latest record IX was released in late 2014 to rave reviews for their renewed approach to invigorating, expansive and experimental rock. 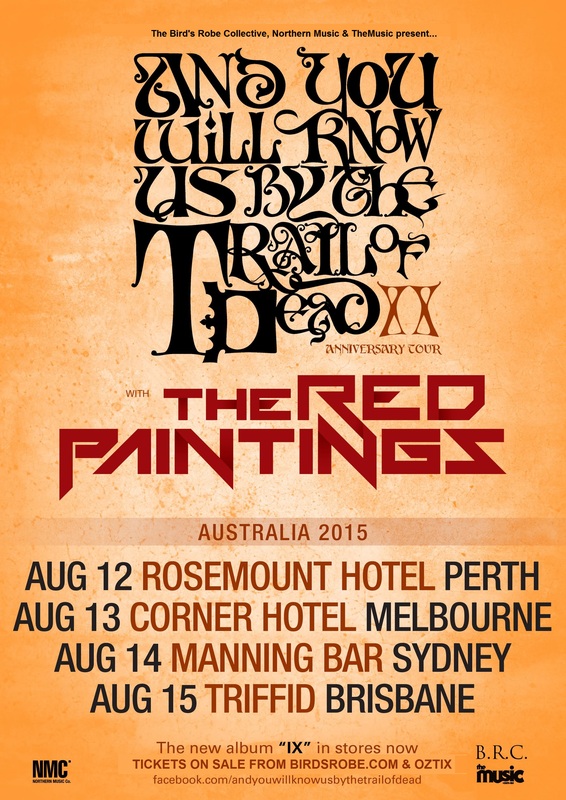 Joining Trail of Dead for all Australian shows are art-rock legends THE RED PAINTINGS who return for a national tour for the first time in 2 years. After a stunning set supporting Mogwai at this year’s Adelaide Festival, the band will continue their ambitious world tour in support of ‘The Revolution Is Never Coming’ with a triumphant homecoming tour. ‘IX’ is out now through Superball Music.